Many building owners and facility executives have experienced unscheduled capital expenditures due to roofing repairs. 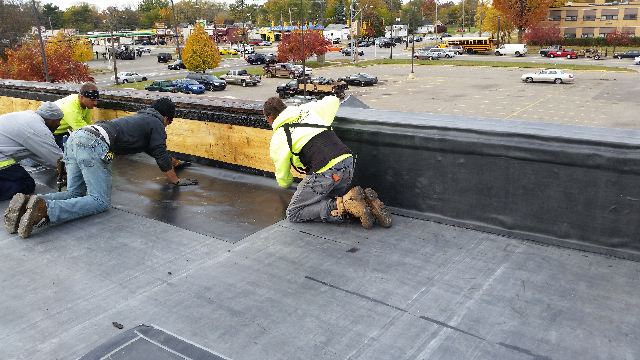 Many of these water-infiltration-related repairs can be avoided by developing and following a scheduled maintenance program for the life of a roofing system. 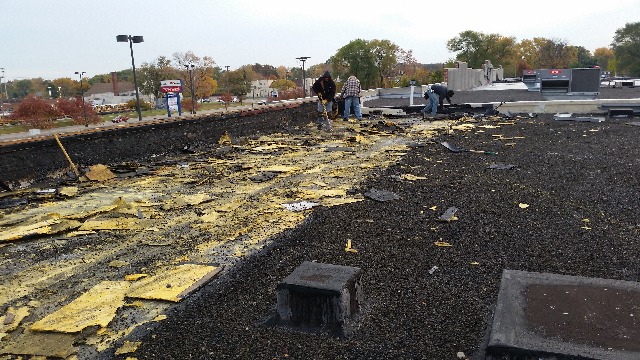 Even with stringent adherence to a thorough maintenance program, however, the decision to repair, recover or replace an existing roofing system will have to be made at some time within or towards the end of the expected service life of the roof. Many issues – such as the location, type of system currently in place, cost, construction schedule, occupant requirements, and long and short-term use of the building – have to be addressed as part of this decision. Although it is possible to identify many of the physical issues that affect roof performance in general terms, the appropriate decision must be addressed on a building-by-building basis. The first step to be taken, before beginning the decision process, is to estimate the remaining service life of the roof. This estimate is derived from factors that include water infiltration, moisture trapped in the underlying insulation, aggregate movement across the roof, bituminous membrane slippage or embrittlement of single-ply membranes. Tri-Star can investigate the existing system and answer these questions for the owner, as well as comment on any related code or technical issues. we may also eliminate false or misleading assumptions, such as incorrectly attributing water infiltration to the roof system when the water is actually entering the building through the adjacent exterior walls. Our service department handles all warranty and service repairs and is ready to respond 24-hours a day and committed to excellence. We provide our customers the very best in superior roofing, customer service and honest workmanship. Our service professionals are knowledgeable, experienced and deliver the highest level of customer satisfaction. Before and after photographs and roof drawings are submitted with each job. Customer roof maintenance history logs are kept on file for future reference. Repairing an existing roof membrane or replacing sections or parts of a roofing system become difficult to justify if the deterioration leading to the need for a repair is due to long-term exposure to the elements or the advanced age of the roof. If the deterioration is extensive, the application of a maintenance coating will rarely solve the problem. Replacing deteriorated base flashings or pitch pockets may eliminate a specific source of water intrusion, but the extensive replacement of isolated components will rarely be cost effective. 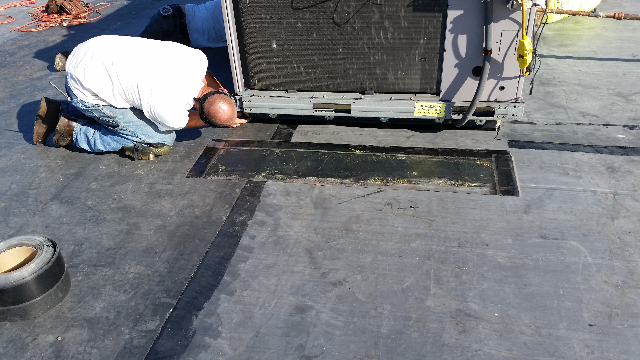 Also, the interface of the new repair elements with the old deteriorated roof membrane is difficult to perform with a consistent level of quality. If the source of water infiltration is identified incorrectly, the roof may be repaired pointlessly several times in an attempt to find the location of the leak. As the roof leaks continue, more interior finishes will be damaged, and the cost for repairs will escalate. If the roof is leaking because the existing system is aged, it will be just a matter of time before the entire system will need to be replaced. In those cases, the cost of the temporary solutions may not be justifiable; the money would be better spent recovering or replacing the roof. Repair or replacement of specific roofing elements can be justified when the causes of damage to a roof membrane are from impact, an isolated incident of poor installation or some other nonsystemic cause. In those cases, once the roof is repaired, the expected service life of the system will be restored. One procedure that should be included as part of any roof repair is an investigation for the presence of moisture below the roofing membrane. Even though the membrane may appear to be in good condition on the surface, the presence of subsurface moisture from other sources may create problems that can only be addressed by the removal of an apparently good membrane. If extensive subsurface moisture is present below the existing membrane, all the wet areas of the roof system should be replaced since wet insulation, wood blocking and gypsum will deteriorate and may lead to further problems, such as mold growth. In any case, the source or sources of moisture must be found and confirmed; otherwise, the conditions may return soon after the membrane is replaced. The continued presence of moisture attributable to an adjacent wall or condensation from the interior of the building may eventually cause structural damage to the roof deck. The cost of investigating for subsurface moisture is justified when compared to the difference between the cost of a new roof system and the cost of a new roof system plus structural repairs. The installation of a new roofing system over an existing roof is, if viable, an alternative approach to roof replacement. The major advantage to this approach, known as recovering, is the cost savings associated with not having to remove and dispose of the existing roof membrane. Another advantage is the reduction of materials sent to landfills because labor, disposal and trucking costs are high and are climbing faster than material costs. There is also an opportunity to improve the thermal performance of the roof system because most recovers include the installation of a thin section of insulation or other material to separate the new roof membrane from the existing roof membrane. A final advantage that recover has over replacement is that the existing membrane stays in place, protecting the interior from water damage while the new roof is being installed. As with repairs, an issue that must be addressed prior to any recover is determining whether moisture is present under the existing system. Trapping water within an existing roof assembly is a problem that often occurs with improperly executed recover projects. If moisture is present under the existing system, additional investigation is warranted. 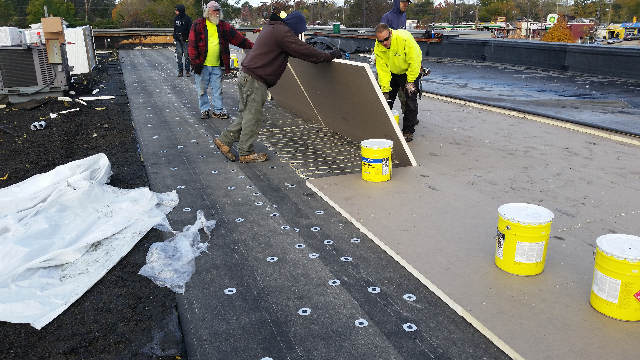 If the subsurface moisture is extensive — 30 to 35 percent or more of the entire roof area — it may be more practical and cost effective to remove the entire roof system and replace it rather than attempting a recover. Another factor influencing whether or not a recover project is feasible is establishing how many roof systems or layers are currently in place, which requires making inspection openings. Most modern building codes allow a maximum of two non-ballasted roof systems on a structure, mostly due to the weight associated with the roofing materials. Other code-related issues are wind up-lift and fire resistance, which the building's insurance carrier may also influence through specific requirements. The length of the warranty required for the new roof also needs to be considered, because many roofing manufacturers will limit the duration for the warranty available on recover projects. Tear-off is mandated by the building code. The existing roofing system has deteriorated beyond being serviceable as a substrate for a recover system. There is extensive moisture below the membrane. The existing roof system attachment cannot provide the wind up-lift resistance or fire protection required for the new roof assembly. There is significant deterioration to the underlying structural deck. The existing roof assembly contains phenolic foam insulation, which, when wet, may create sulfonic and formic acids that will promote the corrosion of steel. Exposure of the interior finishes to water damage during the construction process is a major concern and will influence the selection and design of the roof replacement system. One approach that will facilitate the safe installation of a new roof over an occupied space is to install a temporary roof. In northern and moderate-temperature climates, this temporary roof can remain in place and serve as a vapor retarder in the new roof system. 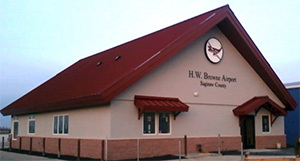 A typical building will accommodate several roofs throughout its existence. Educated decisions pertaining to maintenance, repairs, recovers or replacements can only be made when there is a thorough understanding of the roofing materials and their relationships within a system and to the building. Tri-Star owns and operates its own architectural sheet metal fabrication shop. This gives us the timely flexibility to fabricate and form customized flashing parts and components in a wide range of colors to fit any job. 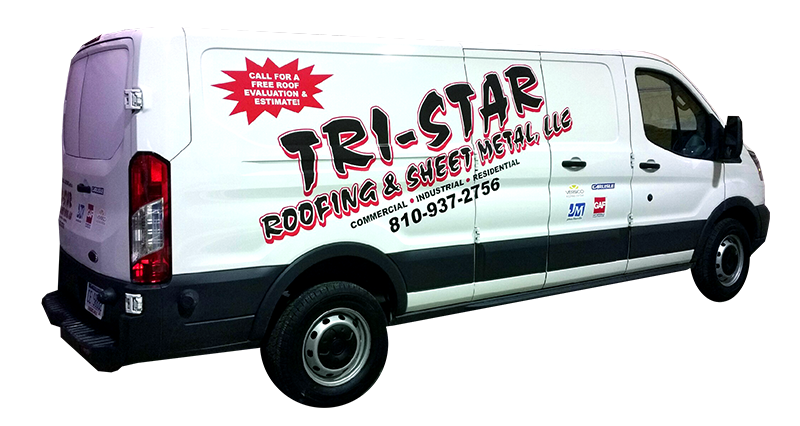 Tri-Star sheet metal roofing systems also offer a wide variety of time-tested materials including copper, stainless steel, and a variety of painted steel and aluminum products. Our skilled sheet metal professionals fabricate and install to your specifications, drawings, and/or building needs. From simple applications to the most complicated, we service both the residential and commercial communities including copper bay windows to radius cornices, to overall new roofing systems. Our quality service and sheet metal production continues to reach new levels of beauty and sophistication. All of our fabrications and installations are closely supervised to ensure the highest quality possible, all of which is in compliance with Sheet Metal Contractors National Association. Metal Roofing, Gutters & Down Spouts, Siding, Copings and MORE!